In June 1952 Sidney Nolan travelled to the Northern Territory and Queensland, under commission from the Brisbane Courier-Mail, to record the effects of severe drought in the north of the continent. 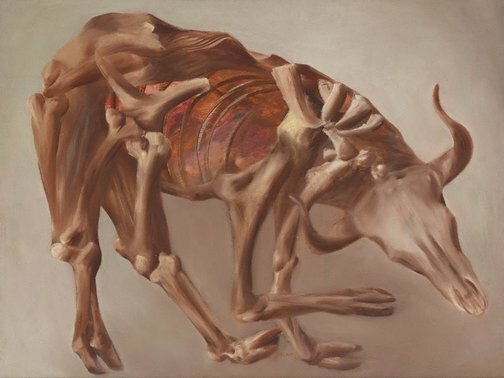 'Drought skeleton', with its heat-seared bony remains, is one of a number of stark, uncompromising paintings created out of this harrowing experience. Nolan’s approach was influenced by a recent visit to Italy where, during a visit to Pompeii, he had gained a similar sense of life suddenly suspended following the eruption of Vesuvius in AD 79. The contorted forms of animals and humans petrified in the ashes – of which he’d seen plaster casts in the Pompeii museum – bore strong similarities to the twisted, yet still life-like, limbs of carcasses that resulted from drought. Signed and dated lower c., yellow/ochre oil "NOLAN/ 53/ .". Sarah Couper, Look , 'God is a drover: Death in the outback', pg. 30-31, Sydney, Nov 2014, 30 (colour illus. ), 31. Clare Morgan., The Sydney Morning Herald , 'Gallery sells off the family silver and strikes gold', Sydney, 21 Dec 2004, (colour illus.). NOTE: Image shows 'Drought skeleton' on display with Judith White, Nelson Meers, Sam Meers and Edmund Capon in front of work. Barry Pearce, Look , 'Gift of three Nolans', pg. 11-12, Sydney, Jul 2003, 12 (colour illus.). Jill Skyes, Look , 'Doing justice to Nolan', pg. 8, Sydney, Mar 2005, 8 (illus.). NOTE: Nelson and Sam Meers and positioned infront of the painting. Sebastian Smee., The Australian , 'Gallery makes room for foundation's gift of Nolans', Sydney, 21 Dec 2004, (colour illus.). Geoffrey Smith, gallery: ngv members magazine , 'Sidney Nolan: Desert & Drought', pg 5-7, Melbourne, Jul 2003, 5-7. NOTE: General reference. Article relates to Desert & Drought exhibition held at the NGV in 2003. Dora Sweetapple, Architecture and arts , 'Sydney shows', pg. 36-37, Melbourne, Feb 1954, 36-37. NOTE: Review of Nolan David Jones' Art Gallery exhibition. Carass reproduced in another version. Sidney Nolan - landscapes and legends: a retrospective exhibition 1937 - 1987 , Sydney, 1987, 114. NOTE: General reference of Nolan's carcasses. Sidney Nolan: such is life , Melbourne, 1987, 121-122. NOTE: General reference. Sidney Nolan - Australia , Sydney, 1979, 116. NOTE: Reference to another Nolan Carass painting. Art Gallery of New South Wales Annual Report 2004 , Sydney, 2004, 19. Art Gallery of New South Wales annual report 2003 [for the year ended 30 June 2003] , Sydney, 2003, 9, 14. Sidney Nolan , London, 2002, 130-133. NOTE: General reference of Nolan's carcasses.